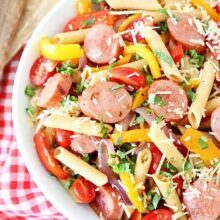 Spicy Sausage and Pepper Pasta-this colorful pasta dish is easy to make and full of flavor! While I was reading a book on the couch, Josh made Spicy Sausage and Pepper Pasta. He had dinner done in 30 minutes! Josh didn’t waste any time, he got down to business and started making his pasta dish. 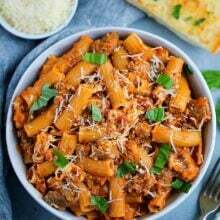 For this recipe, Josh used penne pasta, but any pasta will work. Use your favorite or whatever you have on hand. 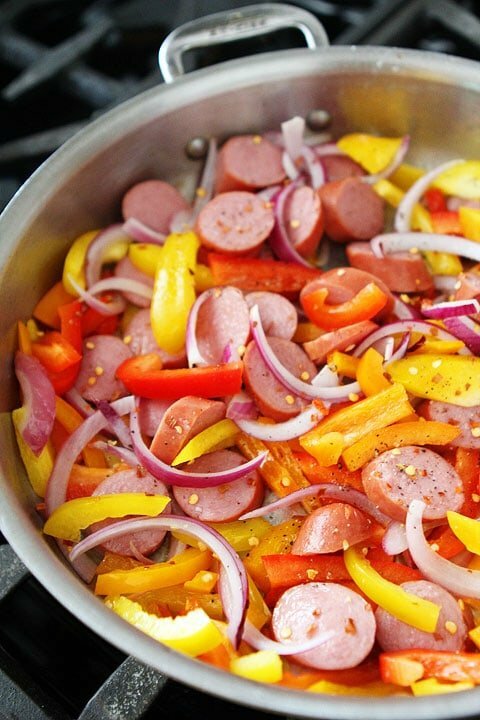 Josh sautéd bell peppers, onions, and Butterball turkey sausage in a large skillet. Josh added crushed red pepper to kick up the heat! He loves spicy food! He combined the pasta, sausage, and peppers in a large bowl and added grape tomatoes, fresh basil, and Parmesan cheese. I did get off of the couch to check out his creation and I was impressed! I took a few photos and let Josh enjoy his meal! He devoured his pasta! He is a true Turketarian! And he ate the leftovers for lunch the next day and said it was just as good, maybe even better! Yay for leftovers! 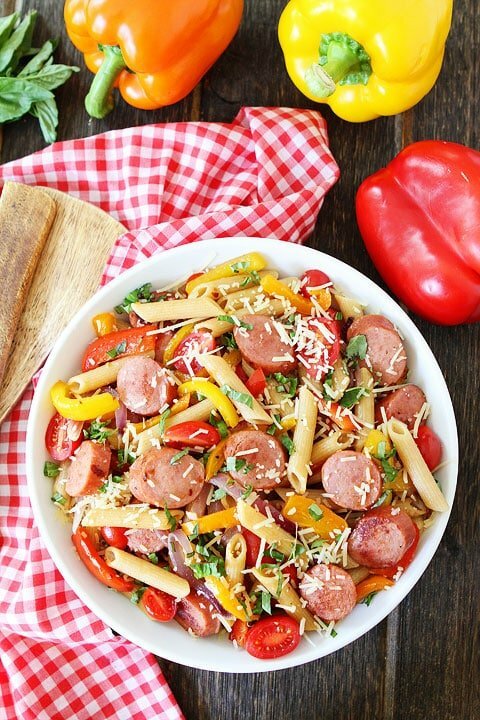 This Spicy Sausage and Pepper Pasta dish is perfect for busy weeknights or an easy summer meal. You can have a delicious dinner on the table in no time! 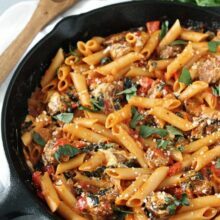 I bet Josh will be making this pasta dish after the baby comes too! Gotta love a tasty and easy meal! 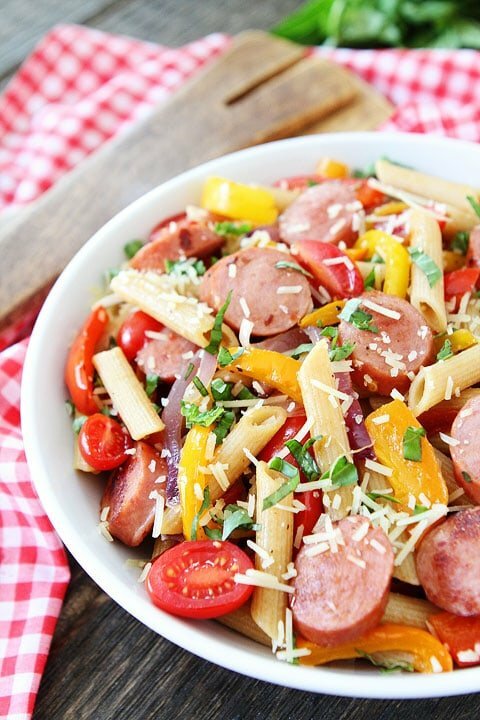 You can have this spicy and colorful pasta dish on your dinner table in 30 minutes! In a large pot of boiling salted water, cook pasta until al dente. While the pasta is cooking, heat the olive oil over medium-high heat in a large sauté pan. Add the onion, garlic, peppers, and sausage. Cook for about 5 minutes, stirring occasionally. Drain the pasta and pour into a large serving bowl. Stir in the onions, peppers, and sausage. Add the tomatoes, Parmesan cheese, and basil. Season with salt and black pepper, to taste. Serve immediately. Oh yum – this looks amazing. Can’t wait to try this recipe! 1. Turkey sausage is my FAV so I am totally diggin’ that you used it here! I’ve been hesitant to make pasta this summer because I don’t want to add extra heat to the house, so I love that most of this is made in one pan–looks like a great summer recipe! 14 years ago, when I was preggy with my first, I was too lazy too and I hated the smell of any garlic or any smell from cooking in the kitchen . So we ate a lot in the restaurants ( mind you, not just any restaurants but the fine ones because this is the only place that my preggy notrils would take) . Also going to these places was an agony by itself in term of finances as well as the commute because I got dizzy whenever I saw a car. I am glad Josh is treating you like a princess this phase of your life. Enjoy it. And, I love this pasta and sausage combo. Take care. Looks great! 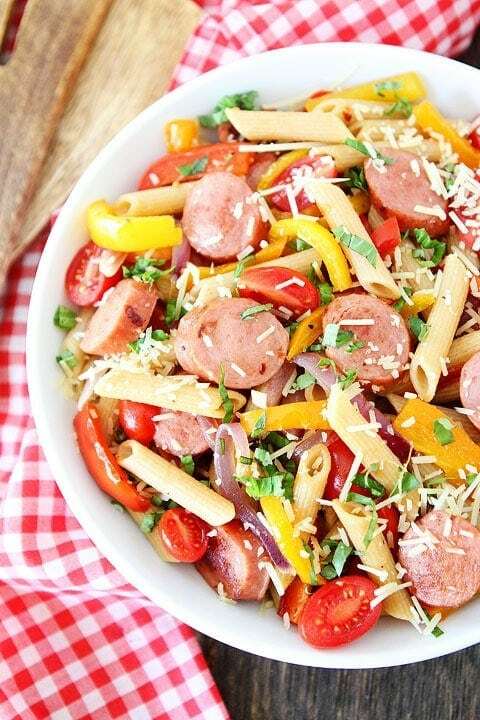 You can’t go wrong with sausages, pasta, and veggies! It is awesome when our husbands are cooking for us, right? I love peppers and spicy pasta. This dish is calling my name!! Pretty picture too. When I was pregnant and didn’t feel like cooking, my husband ordered pizza or picked up a bucket of chicken on his way home, ha! I think I could have really gone for some of THIS instead! What a tasty pasta! Love the addition of the fresh tomatoes at the end! Yum! I love sausage, especially when it’s our pork from our pasture-fed pigs! Can’t wait to try. We have a ton of sausage in our fridge! This would be perfect for them! I know what we are having for dinner tonight! So…if I recall correctly, you are a vegetarian…did you get any supper? Great flavors going on in here. My hubby would devour this. Pinned! Perfect recipe for summer days here in the mountains! That Butterball turkey sausage has become a staple in my house. I love it for quick pasta dishes like this! Simple and colorful- the perfect summer meal. Yum! Love all the colours Maria – looks gorgeous! Definitely going to be making this next week 🙂 Thanks for sharing this! Can’t wait to make this! Do you think it could be served at room temperature? Would be awesome to bring to a picnic! Yes! This would be a great picnic dish! Great dinner idea! Love the peppers! My family would love this dish! So delicious! Love this quick and easy weeknight meal! So what did you and Caleb eat?? Congratulations on your up and coming bundle of joy! I’m due on the 30th so we are getting excited as well 🙂 I was wondering how you balance babies and blogging? This will be a new adventure for me to have a newborn and continue my food blog. Your blog is great by the way! Thanks! I will be honest. It’s not easy:) Adding another little pea to our pod will be interesting. I hope I can keep up! And congrats and best wishes to you! This pasta looks amazing. I love the color. Plus the sausage would make my husband be happy with this dinner. Win win! Just a quick note to let you know I made a version of this last night after we cam back from swimming. This looks so tasty – I bet it’d be great with kielbasa! Thanks for sharing so many great recipes! I made this dish tonight! It turned out great! My whole family loved it including my finicky 4 year old. I didn’t have basil on hand so I used oregano. Its a great dish! this is definitely a delicious summer pasta recipe, love it! This looks super fresh and delicious for summer…and I love easy! Great idea to add tomatoes afterwards so they don’t get mushy! Delish! Love how colorful it is! Really good! Substituted the pasta for spaghetti squash, and it was still great! 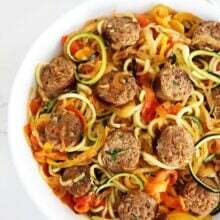 I tried this recipe with a few minor modifications to suit my personal taste (no tomatoes, spicy meat sausage, 1/2 the noodles, extra peppers). It was excellent. I highly recommend it to everyone. It was super easy and quick to make and was delicious! Thanks so much for the fabulous recepie! I made this and your Cucumber, Chickpea, and Pita salad for my birthday meal last month- they were both really, really good! Glad you enjoyed our recipes! This was an excellent recipe! Made it for dinner tonight and it turned out perfect! I cooked my chicken sausages whole first and let them rest so theyou stayed nice and juicy. Drained all the grease and then cooked the veggies. No oil needed! Oh. My. Garsh. I was looking for a recipe for sausage & pasta that didn’t use any creamy/buttery gunk or too much cheese in it. I always look at images to see what looks good before I check out the recipe itself. The image of this pasta grabbed my eye and wouldn’t let go! It looks so yummy that I plan to make it this weekend. All those beautiful colors plus sausage PLUS PASTA? How could it miss? Thanks for posting! Love this recipe! We make it at least every other week. In the winter when grape tomatoes are not the best in Ohio, I substitute a can of petite diced tomatoes and heat gently, then proceed with basil and parmesan. A family favorite! Glad your family loves it!